As many of you already realize, Makenzie suffered a devastating brain injury following a choking incident approximately 2 years ago. Since then, God has led us to utilize a variety of treatment approaches that have been used with varying degrees of effectiveness. Traditional approaches including intensive physical, speech, occupational, feeding, and sensory therapy, as well as hippotherapy and hyperbaric oxygen therapy (HBOT) have produced significant improvements. Makenzie now smiles, laughs, vocalizes, rolls, moves her arms and legs more freely, and is able to hold her head up for indefinite periods of time. Although progress continues to occur, it has slowed during recent months. Brain injuries can continue to heal for decades the greatest benefit from intervention is realized during the first 3-5 years. We feel that while more traditional therapies have in fact produced wonderful results, they have not yet provided Makenzie the degree of improvement possible and necessary to insure the quality of life of which she is capable. Because time is of the essence, it is imperative to move forward with the use of newer treatment approaches. Umbilical cords have historically been discarded, but have recently been realized to be a potent resource for effective stem cell therapy. Unlike embryonic stem cells, umbilical stem cells are harvested from the cord blood of full term infant donors immediately following their birth. Although,advances have occurred in this area, donor stem cells have not yet been approved for use in the United States. However, many successful Umbilical Cord Treatments have been developed in other countries. These treamtments have proven especially effective in the with diabetes, mulitiple sclerosis, Parkinson’s disease, and most importantly, brain injuries. A recent investigation has resulted in first -hand knowledge of the dramatic improvements in motor and cognitive skills experienced by children following umbilical cord stem cell therapy. The most viable and safest program that would meet Makenzie’s needs appears to be the International Cell Medicine Clinic in Costa Rica. We will be traveling to Costa Rica in July 2009 with another family, whose child has already experienced a successful round of stem cell therapy.During this trip, Makenzie will also undergo this treatment. We look forward to great results and accelerated progress. Makenzie’s will also be followed by a noted physician at Children’s Hospital who realizes the potential of Umbilical Cord Stem Cell Therapy. While we are planning to personally fund a significant portion of the expenses from our family resources,but we will fall short of the estimated $20,000 necessary for the stem cell therapy, travel, food, and lodging. An additional $10-12,000 is needed to reach our goal. We are reaching out to our family and friends for financial assistance in this exciting endeavor. 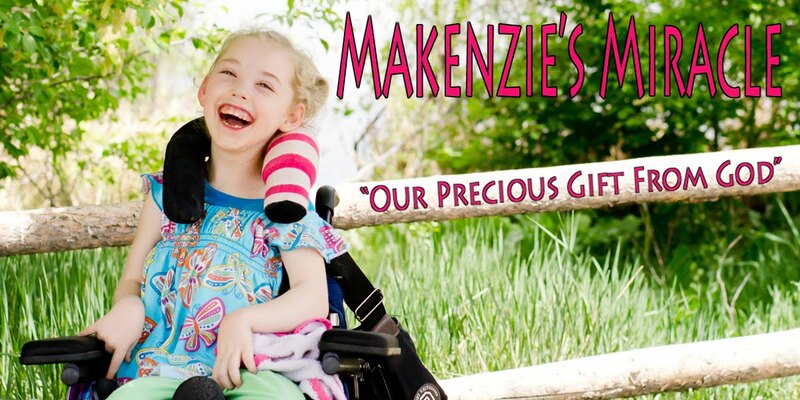 Makenzie continues to touch the hearts of all who meet her. Please consider helping her to realize her full potential.